These are the best roast potatoes, ever. It’s not even particularly complicated. You won’t have to be brining potatoes 5 weeks in advance, or sourcing rare artisan spuds from the foothills of the Andes… in fact you’ll only need three ingredients. Potatoes, salt and beef tallow. SAY WHAT? Yup, step aside, bacon grease, there’s a new sherif of Flavortown (and it is not, nor has it ever been Guy Fieri). Beef tallow is basically just rendered beef fat, and this method essentially is a hybrid of frying and roasting. I used the king of all beef fats – Snake River Farms Kobe Tallow, which they generously sent me to sample. If you can’t find beef tallow near you, you can always render your own (instructions here). You can also use chicken, goose or duck fat, if you wish, but I reckon beef tallow tastes best of all. Impossibly crisp and crunchy on the outside, pockets of rich beefy-fat goodness, giving way to fluffy, tender potato within. 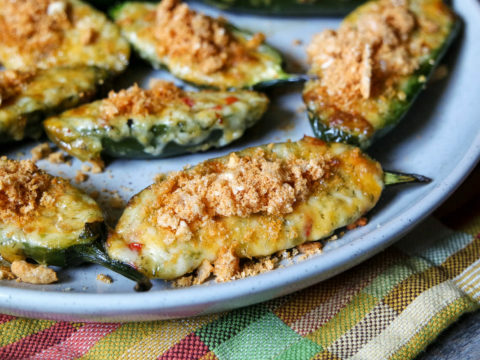 They may be the perfect side for any meat dish, and make one helluva snack on their own. You can substitute the beef tallow for goose, chicken or duck fat. All will result in a super crisp finish, but beef has more flavor. Preheat oven to 450f/230C. Place tallow in a roasting pan and place the pan in the oven to melt and heat up. Par-boil the potatoes (starting them off in cold, salted water), until a sharp knife can pierce them with little-medium resistance. The key here is to cook them enough that the outsides are soft and will "fluff up", but not so much as they are cooked all the way through. Drain potatoes into a colander. Shake vigorously to rough and fluff the exterior. You can even use a metal spoon to toss them around roughly and really make the edges shaggy. The more you do this, the crisper the results. Carefully pour potatoes into the pan with the hot, melted tallow. They will sputter and spit a bit as they hit the fat. Sprinkle with salt and allow to roast for 45 mins. Once cooked, if there is still fat left at the bottom of the pan, drain the potatoes out onto paper towels for 1-2 minutes then serve.